Reviewed by Laurence Davies on 2017-07-02. When certain rivers flow together -- the Monongahela and the Allegheny, the Rhone and the Arve, the Jialing and the Yangtze come to mind-- the characteristic colors, temperatures, and textures of the individual rivers do not merge immediately. Will Tattersdill places the first comma of his title with notable cunning. Yes, he is going to discuss the proliferation of science fiction in English illustrated magazines of the late nineteenth and early twentieth centuries (English rather than British because most were published in London although read all across the United Kingdom and in the colonies as well). Yet for a variety of reasons, he is in no rush to merge the science with the fiction. Indeed, all through this engaging book he lets the distance between what we might call two modes of human understanding fluctuate. As he observes, "It is a strength of both 'sides' that there is no one coherent activity called literature, no one activity called science; that they are diffuse categories capable of adaptation and evolution" (3). To put the case another way, whether taken together or singly, the arts and sciences are more often than not in a state of creative and epistemological flux. Within the timespan of this book, all sorts of boundaries, beliefs, theories, and material practices exemplify this instability. In the sciences, for example, aether vanished and radio waves appeared; bodies became transparent to x-ray technology; old debates about epidemiology, the social implications of natural selection, and the scientific investigation of spiritualism flared up; and for a while, the presence of intelligent life on Mars was a given widely shared. In the sphere of literature, the three-volume novel was pensioned off, and, liberated from the prissy demands of the circulating libraries, the house of fiction was spring-cleaned, realists and romancers flourished and took issue with each other, and writers of short fiction--male and female alike-- enjoyed a boom unprecedented and never since surpassed. Tattersdill's awareness of the provisional in scientific work owes a freely recognized debt to Bruno Latour, and particularly to Pandora's Hope (1999), a collection of essays on what Latour calls Science Studies, which treat such topics as the scientific politics of soil-collecting in the Amazon Basin and the diffusion of Pasteur's research on germ theory and microbial fermentation. Tattersdill shares Latour's fascination with "enrolment" (the French equivalent is inscription) and "entanglement" (enchevêtrement), the processes by which ideology and material circumstances create a scientific climate. 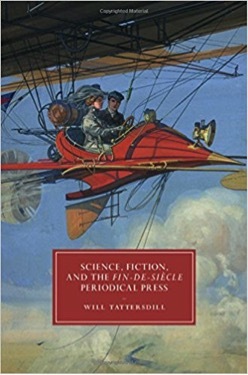 Indeed, by giving special attention to genre fiction, Tattersdill contributes both to literary history and to science studies. In the period he deciphers, science fiction as a concept or a label was inchoate. Jules Verne, who revered both exploration and taxonomy, named his works Voyages extraordinaires. Charles Howard Hinton, inventor of the baseball pitching machine and, until shown the door for professing the ability to see into the fourth dimension, a member of the Princeton Department of Mathematics, called his parables of higher dimensional geometry "scientific romances" as early as 1885, but after that the term lay dormant until 1933, when H. G. Wells adopted it retrospectively to characterize such works as The Time Machine and The Island of Doctor Moreau, written in the nineties. Meanwhile, in 1926, the broadcaster and editor Hugo Gernsback founded Amazing Stories, the first magazine entirely given over to "scientifiction." Tattersdill, however, prefers a far more varied menu. He relishes what have been called Standard Illustrated Popular Magazines by Mike Ashley, who has published widely on genre writing and curated the British Library's 2011 exhibition Out of This World: Science Fiction But Not As You Know It. Tattersdill says of these magazines: "They are endlessly exciting because the next item might equally be a horror or romance tale, a nautical adventure, a detective story; or it could be an interview, an opinion piece, political commentary, or popular science" (1). Over the last two or three decades, the old "Two Cultures" debate between C. P. Snow and F. R. Leavis has given way to other battles, other controversies. Among the fiercest of these is the conflict between the purist defenders of academic departments and the champions of interdisciplinary programs. Tattersdill is with the champions, a fox rather than a hedgehog, an enthusiast for creative blending among disciplines and, in his home discipline, a wanderer who strays happily across the boundaries between fiction and non-fiction, not to mention the canonical and what is likely to remain the uncanonical -- uncanonical yet telling. One should distinguish, though, between Tattersdill's delight in the pleasures of haphazard reading and his (and our) delight in a well-laid argument, brick by brick and course by course. Several structural principles inform the book's four main chapters. Each of them deals with a major topic of the day relevant to the understanding of space and time: the possibility of life on Mars, the future of our own planet, the discovery of x-rays, and polar exploration. The author treats these topics in terms of current scientific research and the responses of journalists, essayists, and fiction writers, whether pellucid, misinformed, inspired, or all three. Each chapter cites essays and serial novels by H. G. Wells. Each discussion also leads to a metacommentary on communication as shaped in the "heteroglot space of the periodical press" (90) by the interlocking forces of imperialism, new advances in illustration and typography, the shrinking of global distances, the curiosity of a new, more literate generation of readers, and the electrifying style of the New Journalism. Since the examples and the deployment of arguments in all four chapters are, like the illustrated magazines themselves, full of surprises, I shall take Chapters Two and Three to represent the whole. Two is titled "Distance over time: Using periodicals to predict the future." Several of the speculative articles discussed here are concerned with the improvement of what already exists; they are "about the futurity of the present, not about the future itself" (76). A nineteenth century piece on twentieth-century dining praises the virtues of concentrated food and drink, illustrated by doctored photographs showing, inter alia, "a banquet in a pill box" (76); likewise, writing in 1896, Mary Augusta ("Mrs Humphry") Ward imagines that in 1930, florists will show better taste, and the "disagreeable noises" of city life could be countered by tram-lines engineered "to emit a deep and musical note" (75). Rudyard Kipling's story "With the Night Mail" offers a livelier immersion in the future. It is not so much a prediction as a thought experiment, a "what if" springing from the idea of an international body, the Aerial Board of Control (or ABC), a world government whose overarching mission is to sustain and regulate the traffic of the skies. The narrator is a journalist reporting on a dirigible flight from London to Quebec City. In its American form (McClure's Magazine, November 1908), the date is 2025; in its British version (Windsor Magazine, December 1908), it's 2047. Both magazines present the narrative as an article from a future issue. The American version (and the UK text in Kipling's collection Actions and Reactions, 1909, where the imaginary setting is 2000) embeds the story in a carnival of paratexts such as "Notices to Airmen," a book review, correspondence, and advertisements for aviation clothing, competitions, jobs, spare parts, and launching rigs. The Windsor Magazine publication lacks these paratexts, which play so wittily on the paradoxes of the past in the future and the future in the past. Unlike the more somber and oblique sequel, "As Easy as ABC," "With the Night Mail" has long been popular with science fiction authors, thanks to its evocation of a detailed future world. As so often in Kipling, the technical details are carefully thought out and may well have been taken from an article in the London Magazine (June 1905) by the great Brazilian aviator Alberto Santos-Dumont. Tattersdill writes shrewdly on another feature of Kipling's art: the cunningly hidden time shifts in the narrative from past to present tense and finally back again. With "enrolment" in mind, Tattersdill is much taken by the thematic and visual links to other illustrated magazine articles, not least those set in the present and not in the least speculative, such as the powerful description of an undersea garden that also appeared in the December 1908 Windsor. He says of the paratextual dating, "it is part of the story, but looks like part of the magazine" (67). In Chapter Two, this coupling of periodicals within and without the narrative features again in Tattersdill's discussion of The Time Machine. He points out that the weekly gatherings at the Time Traveller's house in outer-suburban London resemble in the range of their discussions the heterogeneity of the magazines. When the Traveller returns from his alarming encounter with a far future under the sway of entropy, he renews his grasp on his own day by looking at the date on the latest issue of the Pall Mall Gazette and checking his clock for the exact time (84). As Tattersdill brings out well, the Traveller appears as a careful observer, and, one suspects, looks more like a working scientist than did most of his contemporaries in popular fiction. Nevertheless, his very distinctiveness in this regard highlights a general principle: "a profitable view of disciplinary relationships and of SF's own history emerges once fact and fiction are approached other than as straightforward opposites" (93). Chapter Three, however, "New photography: X-rays and the images of the New Journalism" largely deals with misappropriations and misprisions rather than symbioses. Working in his laboratory at the University of Würzburg in November 1895, Wilhelm Röntgen detected what came to be known as X-rays and published his first paper on the discovery in December. An English translation appeared in Nature three weeks later, and within three months of that event, Pearson's Magazine published a twelve-page interview with Röntgen himself. Placing this new form of radiation and the images it could generate in the scheme of things challenged the physicists at a time when that whole scheme was under constant revision. Meanwhile, some doctors quickly saw the possibilities for research and diagnosis. (John Macintyre founded the world's first radiology department at the Glasgow Royal Infirmary in 1896, and in 1898 deeply impressed Joseph Conrad by making an image of his hand and talking of the "inconceivable tenuity" of matter.) The ubiquitous editor, democrat, and spiritualist W. T. Stead wrote on "Psychic Photography" and "Psychic Pictures without the Camera." Journalists, fiction writers in the magazines, and copy writers seized on more frivolous possibilities. Tattersdill's examples include an advertisement for Sozodont, a mouthwash whose sterling qualities were revealed by X-rays, a story about a machine that could photograph thoughts, and a Gothic tale published in April 1896 (in the same issue of Pearson's as the Röntgen interview) about a woman driven mad when she sees a photograph of her own skeleton. Describing the atmosphere of bafflement, marvel, scientific diligence, and opportunism prevailing in the 1890s, Tattersdill writes: "I propose to understand X-rays here as part of a spectrum of equally unbelievable and laughable ideas, some of which were true" (96). This book mines the by now copious literature on the culture of the late Victorian and Edwardian period. It cites Laurel Brake on "subjugated knowledges," Kate Flint on the visual imagination of the Victorians, Andy Sawyer and Patrick Parrinder on science fiction, Carol Levine on suspense, James Mussell on periodicals, Roger Luckhurst on all things weird and wonderful, and many, many more. It also draws in Bakhtin, Barthes, Sontag, and Habermas, not to mention Latour. There is nothing dutiful in any of these choices. Tattersdill not only describes the polyphony of voices in the periodicals; he himself is an inspired polyphonist. What's more, he succeeds in being original throughout. One can quibble with a few details. For instance, his treatment of The Time Machine is a wee bit out of kilter. Though Tattersdill writes that it was first serialized in the New Review, a different version had already appeared in the National Observer, and, come to that, while still a student at the Normal School of Science in South Kensington, Wells placed in the Science Schools Journal an amusing if not well-fledged prototype rebarbatively called "The Chronic Argonauts." Of course the Science Schools Journal was not a general interest magazine, but neither were the National Observer and the New Review. The third instalment of The Time Machine in the New Review, for instance, appeared beside essays on "The Poetry of the Prison," "Politics in Newfoundland," "Mr Balfour's Philosophy," and "The Passing of England: An Enquiry Concerning the Nation and the Navy." In other words, the contents of the New Review reflect the passions of William Ernest Henley, the poet of stoicism and counter-decadence, and The Time Machine was an almost perfect match for his convictions. Yet to fuss about the New Review's not being a standard illustrated magazine goes against the entire spirit of Tattersdill's project. Throughout he insists in a most amiable way that literature and science are intersecting continuums, that building generic or disciplinary walls is as unproductive as the political kind. What's more, in a spirited Conclusion that is "entangled" with literary studies in the present, he affirms--rightly, I believe--the value of his multifarious approach. "Without claiming expertise in scientific subjects -- without thinking imperially," he writes, "we can show connections, reveal historical associations, shed light on ideological commonalties. A first step in doing so is to avoid the language of conflict, to caution against the easy opposition of categories of knowledge" (188). Laurence Davies is Honorary Senior Research Fellow in the School of Modern Languages and Cultures at the University of Glasgow and General Editor of the Collected Letters of Joseph Conrad. A volume of Selected Letters appeared in 2015. Leave a comment on Laurence Davies's review.